A guy I know who works on lawnmowers has a running Kubota 3 cylinder diesel engine he wanted to sell me for $300. They make about the same HP but more torque than the 600 cc two stroke. Being a three cylinder I don't know if it would fit in my Trabant even though people have installed Wartburg engines in their Trabants, but from what I've read from others that have installed these Kubotas into cars they get about 60+ mpg! Top speed is about 60 mph. 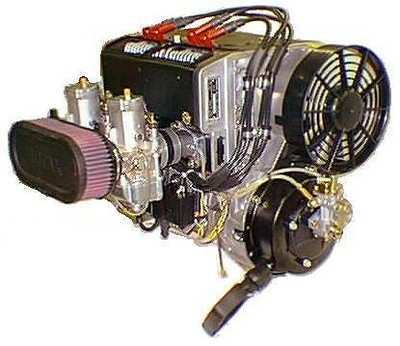 Actually I'd rather go with a modern Rotax 2 cycle air cooled snowmobile engine. A guy I know up the street is into doing engine swaps and has a C&C machine. I took him the wheels from my Trabant to be sandblasted and mentioned putting a Rotax engine in it and he showed me this ultra-light he had with a Rotax engine. This engine below is around half the displacement yet makes 35HP. Of course there are others around 600cc that makes 60 HP. One issue I've seen with these engines is the carbs seem to be all on the backside of the engines. This maybe an issue with transverse leaf spring suspensions. You could install it upside down. Then the rope for the pull handle would stick out through the grill. Actually I could run the cord out the defunct petcock valve hole in the dashboard and start it if the battery goes dead. Would it run upside down being two stroke ,not sugesting you do it but is there any reason it would't work? well the float in the carb wouldn't work, you'd have to Install them right side up. but is the fuel in the crankcase in a gaseous or liquid state? IIRC the Belgian importer started fitting Ford diesel engines into the Barkas vans they sold in the 1980's. I'd be inclined to install a VW 3 cylinder TDi or TSi engine if I were to do a Barkas engine swap. Sort of the right noise and it would keep it in the family. DKW got bought by VW in the 1960s and then gave its FWD and 4-stroke inline watercooled engine technology to VW (both transverse and inline layouts).